Pricing includes freight to one metro location - see freight policy. 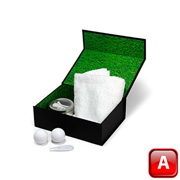 All you need to do now is to work out where your playing!This combo includes: 2 x A Grade golf balls (pad print) 1 x large golf towel (embroider) 1 x plastic pitch repairer (pad print) 1 x Tin of 30 x tees (p - same as golf ball) (assorted colours available) packed in the new golf gift box. lid pad printedLead Time: 10 days. The most popular corporate golf day gift on the market.This tower includes: 2 x A Grade golf ball (pad print) 6 x 70mm wooden tees (assorted colours available) 1 x plastic pitch repairer (pad print) 1 x plastic ball marker (pad print)Lead Time: 10 days. A great way to show of your clients logo.This tube includes: 2 x A Grade logo golf balls (pad printed) neatly presented in a clear tube with black end caps.Lead Time: 10 days. The perfect novelty golfing gift.This combo includes: 1 x mini golf bag shaped bag with carabiner clip 2 x A Grade golf balls (pad printed) 5 x 55mm wooden tees (assorted colours available)Lead Time: 10 days. 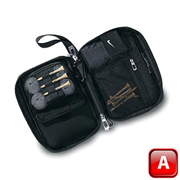 Co-brand with the biggest sporting brand in the world.The Nike Golf Accessories Pack combo is a great way to reward your best customers.This combo includes: 2 x A Grade golf balls (pad printed) 1 x Nike golf accessories pack (transfer) 10 x 70mm wooden teesLead Time: 10 days. All you need to do now is to work out where your playing!This combo includes: 2 x B Grade golf balls (pad print) 1 x large golf towel (embroidered) 1 x plastic pitch repairer (pad print) 1 x Tin of 30 x tees (pad print - same as golf ball) (assorted colours available) packed in the new golf gift box.Lead Time: 10 days. 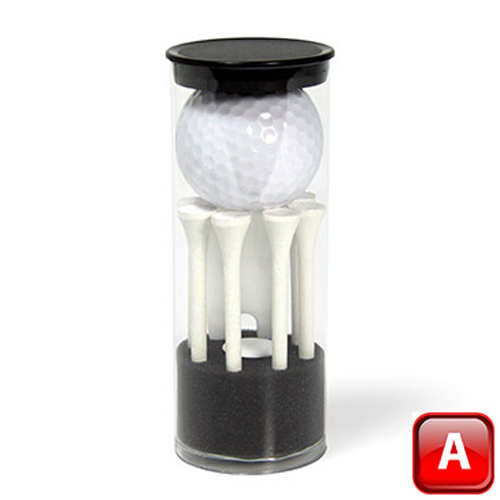 The most popular corporate golf day gift on the market.This tower includes: 2 x B Grade golf ball (pad print) 6 x 70mm wooden tees (assorted colours available) 1 x plastic pitch repairer (pad print) 1 x plastic ball marker (pad print) Lead Time: 10 days. A great way to show of your clients logo.This tube includes: 2 x B Grade logo golf balls (pad printed) Neatly presented in a tube. Lead Time: 10 days. 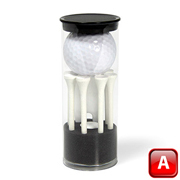 The perfect novelty golfing gift.This combo includes: 1 x mini golf bag shaped bag with carabiner clip 2 x B Grade golf balls (pad printed) 5 x 55mm wooden tees (assorted colours available)Lead Time: 10 days. Co-brand with the biggest sporting brand in the world.The Nike Golf Accessories Pack combo is a great way to reward your best customers.This combo includes: 2 x B Grade golf balls (pad print) 1 x Nike golf accessories pack (transfer) 10 x 70mm wooden teesLead Time: 10 days. 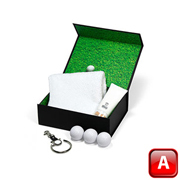 All you need to do now is to work out where your playing!This combo includes: 2 x C Grade golf balls (pad printed) 1 x large golf towel (embroidered) 1 x plastic pitch repairer (pad printed) 1 x Tin of 30 x tees (p - same as golf ball) (assorted colours available) packed in the new golf gift box.Lead Time: 10 days. A great way to show of your clients logo. 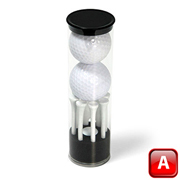 This tube includes: 2 x C Grade logo golf balls neatly presented in a clear tube with black end caps.Lead Time: 10 days. 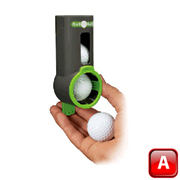 The perfect novelty golfing gift.This combo includes: 1 x mini golf bag shaped bag with carabiner clip 2 x C Grade golf balls (pad printed) 5 x 55mm wooden tees (assorted colours available) Lead Time: 10 days. All you need to do now is to work out where your playing!This combo includes: 2 x D Grade golf balls (pad print) 1 x large golf towel (embroidered) 1 x plastic pitch repairer (pad printed) 1 x Tin of 30 x tees (p - same as golf ball) (assorted colours available) packed in the new golf gift box. Lead Time: 10 days. 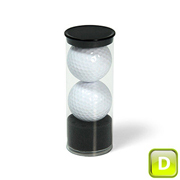 The most popular corporate golf day gift on the market.This tower includes: 2 x D Grade golf ball (pad printed) 6 x 70mm wooden tees (assorted colours available) 1 x plastic pitch repairer (pad printed) 1 x plastic ball marker (pad printed)Lead Time: 10 days. 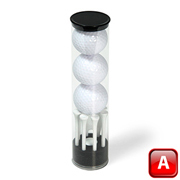 A great way to show off your clients logo.This tube includes: 2 x D Grade logo golf balls (pad printed) neatly presented in a clear tube with black end caps. Lead Time: 10 days. 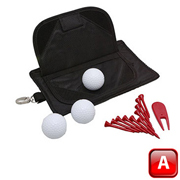 The perfect novelty golfing gift.This combo includes: 1 x mini golf bag shaped bag with carabiner clip 2 x D Grade golf balls (pad print) 5 x 55mm wooden tees (assorted colours available) Lead Time: 10 days. 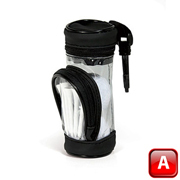 Give your clients brand life after the golf day with this reusable valuables pouch and all the tools to have the perfect round.This combo includes : 3 x A Grade logo golf balls (pad printed) 10 x 70mm wooden tees (assorted colours available) 2 x ball markers 1 x plastic pitch repairer packaged in a valuables pouchLead Time: 10 days. 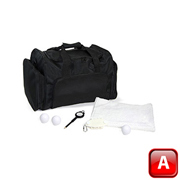 Perfect for a welcome pack or prizes on the day.This combo includes: 1 x black shoe bag (embroidered) 1 x large golf towel in navy, white or black (embroidered) 3 x A Grade golf balls (p) 1 x standard tee pack (10 x tees, 2 ball markers and a pitch repairer)Lead Time: 10 days. 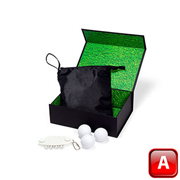 When presentation matters as well as life after the golf day with everlasting branding.This combo includes: 1 x valuables pouch (embroidered) 3 x A Grade golf balls (pad printed) 1 x Oval tee caddy with 8 tees, 2 ball markers on a neat little caddy (pad printed) packed in a presentation gift boxLead Time: 10 days. 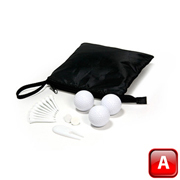 The perfect combination of golf balls and tees.This combo includes: 1 x mini golf bag shaped bag with carabiner clip 3 x A Grade golf balls (pad printed) 5 x 55mm wooden tees (assorted colours available)Lead Time: 10 days. 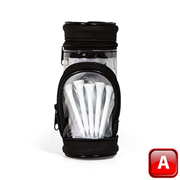 Keep score and hold all your golf accessories.This combo includes: 1 x deluxe scorecard holder (transfer) 3 x golf balls (pad printed) 1 x tee pack (10 x 55mm tees, 2 ball markers & plastic pitch repairer)Lead Time: 10 days. The new Ball Kaddie dispenser now comes as a combo and is the perfect tournament gift that will last long after the golf day.This combo includes: 1 x Ball Kaddie (pad printed) 3 x A Grade golf balls (pad printed)Lead Time: 10 days. 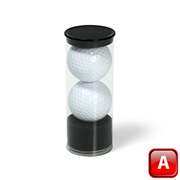 A great way to show of your clients logo.This tube includes: 3 x A Grade logo golf balls (pad printed) neatly presented in a tube.Lead Time: 10 days. 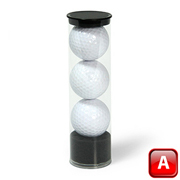 The perfect number of golf balls and accessories.This tower includes: 3 x A Grade golf balls (pad printed) 6 x 70mm wooden tees (assorted colours available) 1 x plastic pitch repairer (pad printed) 1 x plastic ball marker (pad printed)Lead Time: 10 days.